During a terrible drought in the African savannah, a little bat helps to bring rain, renewal of the forest and a bountiful harvests in this original tale by Mollel. The tale also explains why bats come out only at night and why the sun pauses momentarily at the end of each day before it sinks below the horizon. In writing the story, Mollel was inspired by his fascination as he grew up in the Eastern African country of Tanzania, with the stark difference between dry and rainy seasons, the two main seasons in the East African savannah. He was struck by the magical changing of the seasons. 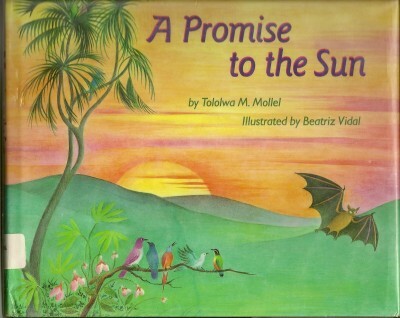 A Promise to the Sun has been translated into the South African language of Afrikaans. Mollel has adapted the book into a play, which will be published in an anthology by the Playwrights Press of Canada. To see details about the play, see A Promise to the Sun – the Play. Long ago, when the world was new, a severe drought hit the land of the birds. The savannah turned brown, and streams dried up. Maize plants died, and banana trees shriveled in the sun, their broad leaves wilting away. Even the nearby forest grew withered and pale. The birds held a meeting and decided to send someone in search of rain. Mollel imbues his unaffected yarn with a modicum of drama … [and illustrator] Vidal’s watercolors, rendered in her typically dynamic palette, feature a brightly colored array of geographically appropriate flora and fauna. Mollel’s skillful storytelling with its economical yet vivid descriptions will be enjoyed by readers, listeners and storytellers alike. …a rare book that, once read, leaves the mind uplifted by its prose and stimulated by its images.